2011 began ominously when thousands of blackbirds dropped dead out of the sky in Arkansas. Remember that? A few days later, in Louisiana, it happened again. 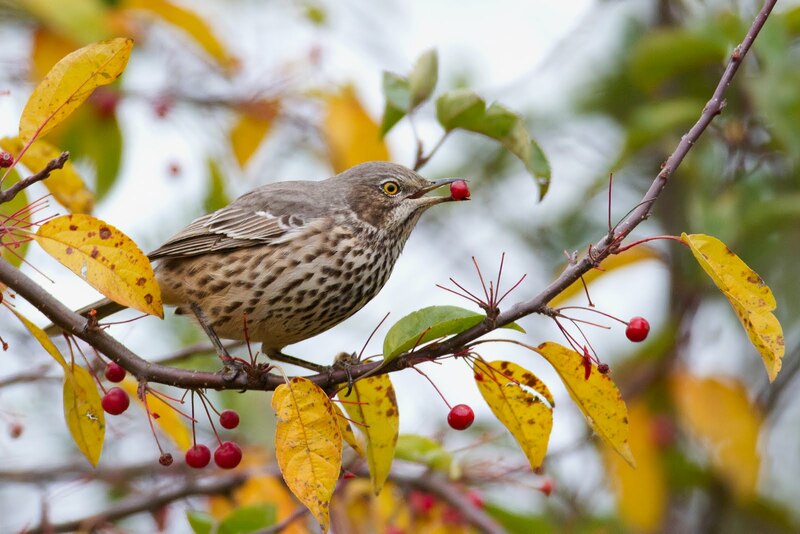 Thankfully, it was not a nationwide trend and avian conditions soon returned to normal. For birders, normal is great. In any season, there is always something to see, share and discuss. But sometimes things are better than great, like last month along the Chicago lakefront. There, and also in Oak Park, some crazy, magical stuff took place, producing a string of local rarities that will long be remembered. The fun began on Oct. 29 with the discovery of a sage thrasher at Montrose Beach. It was only the 5th Illinois record for this species, a rare visitor from the west. Amazingly, the bird lingered in the same general area for weeks. It was a “lifer” for most birders, including me. Meanwhile, three more western vagrants were on the way! A mountain bluebird appeared at Illinois Beach State Park in Zion on Nov. 10, followed by a Brewer’s sparrow at Chicago’s Northerly Island on Nov. 12. Then, against all odds, a Townsend’s solitaire turned up at Montrose and actually visited the very same fruiting bush favored by the sage thrasher. They don’t call it the Magic Hedge for nothing. But it wasn’t over. Two snowy owls delighted the Montrose faithful on Nov. 19, and then a probable broad-tailed hummingbird (yet another westerner) appeared at an Oak Park feeder. The hummer, still around in early December, attracted major-media coverage as well as birders from several states. If confirmed, it would be the first documented broad-tailed hummingbird for Illinois. Other notable finds in Chicago during 2011 included a Ross’s gull in late March (Illinois’s 3rd) and a green-tailed towhee in October. Here in DuPage County, more than 8,000 migrating sandhill cranes passed over the Greene Valley Forest Preserve hawkwatch on Nov. 16. The counters are still recovering. Ah yes, “The Big Year,” surely one of the highlights of 2011. The movie was a box office bomb but birders generally liked it and I’ll bet some of us will even buy the DVD. Or at least visit Redbox. Thanks to the all-star cast and a modest promotion campaign, “The Big Year” was noticed by a lot of people who are not yet birders. Lots of people told me about it (just in case I hadn’t heard). Another 2011 event that seemed to transcend the birding community was an “eagle cam” in Decorah, Iowa. People all across America were logging on to watch those birds—an avian version of “The Truman Show” with Jim Carrey. Kudos to the Raptor Resource Project for making it happen. Speaking of eagles, lots of opportunities to get a winter fix: Bald Eagle Days in the Quad Cities, Jan. 6-8; Clinton Eagle Watch, Jan. 7 (at lock and dam #13, near Fulton, IL); and Starved Rock Eagle Watch Weekend, Jan. 28-29. I love that new species of birds are still being discovered. In 2011, Bryan’s shearwater joined the list of about 10,000 species worldwide. I’ll probably never see a Bryan’shearwater, but I did add two birds to my life list this year: the sage thrasher in Chicago and Florida scrub jay, found at Merritt Island National Wildlife Refuge. Something else I love: the new “environmental” license plate for Illinois. I’m still getting used to the green background but the cardinal illustration is much improved. We owed that to our state bird. Canada might finally get a national bird. Red-tailed hawk is reportedly leading in the Canadian Raptor Conservancy’s online poll. If you like owls, conservation and wine, check out threehoots.com. A great-horned owl presented me with a gift on Aug. 2. It was daybreak and I’d just finished my workout at the Glen Ellyn YMCA. As I walked to my car I heard some hooting. I followed the sound until I was behind the building, at the little field where my son once played t-ball. For a few minutes I just sat on the bleachers to listen and remember. Birding can slow us down sometimes, and this is good. In April, Team Sapsucker from the Cornell Lab of Ornithology set the North American Big Day record by finding 264 bird species in 24 hours. In Texas, of course! Best feel-good bird story of the year: The return of the two Mooseheart eaglets to the wild on Nov. 13. The birds spent five months at Flint Creek Wildlife Rehabilitation in Barrington after falling from their nest last May. Saddest bird story of the year: In May, a 38-year-old Naperville man was struck and killed when he attempted to help a family of ducklings across I-294, near O’Hare. Moving from sad to just plain disappointing, Kentucky passed a measure allowing sandhill cranes to be hunted in that state beginning Dec. 15. The hunt will last 30 days or until 400 birds are dead. Thirteen western states allow crane hunting but Kentucky is the first state east of the Mississippi to do so. I’m OK with hunting, and I buy a federal duck stamp every year. But cranes? Have you heard about the new Frontier League baseball team, the Schaumburg Boomers? The mascot is a greater prairie chicken. Sweet logo. Gotta get me a hat. 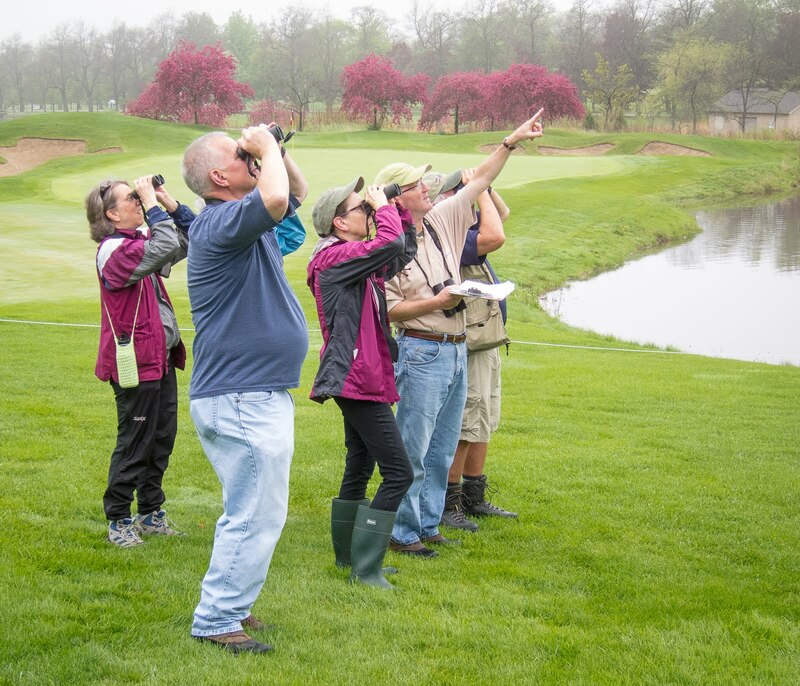 Birders are allowed to watch mammals, too! My favorite four-legged sighting of 2011 was a 13-lined ground squirrel at Prairie Landing Golf Club in West Chicago, in June and again in August. We are at the far eastern edge of this species’ usual range. New books on my nightstand, waiting patiently for my tired eyes: “Avian Architecture,” by Peter Goodfellow, and “Bird Coloration,” by Geoffrey Hill. Finally, was it three or four times that I went searching for the pileated woodpeckers reported on the east side of The Morton Arboretum? Never did see one. But it’s OK—finding that bird gives me yet another excuse to go birding in 2012. I hope that you find lots of excuses, too. Make the time and get out there! Best wishes for a wonderful new year of birding and discovery.